The only thing Avery Hood can remember about the night her parents died is that she saw silver—deadly silver, moving inhumanly fast. As much as she wants to remember who killed them, she can't, and there's nothing left to do but try to piece her life back together. Then Avery meets the new boy in school—Ben, mysterious and beautiful, with whom she feels a connection like nothing she's ever experienced. When Ben reveals he's a werewolf, Avery still trusts him—at first. Then she sees that sometimes his eyes flash inhuman silver. 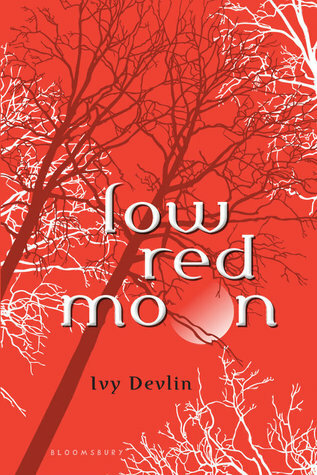 And she learns that she's not the only one who can't remember the night her parents died.Part murder mystery, part grief narrative, and part heart-stopping, headlong romance, Low Red Moon is a must-read for teen paranormal fans. Alright...*sigh*...where to begin....I really wanted to like this book. One of my favorite types of books to read is retellings of myths or fairy tales. When I read the blurb on GoodReads, and found another take on Little Red Riding Hood, and of course, add in a dash of paranormal by making the wolf a shape shifter, and we will have a Happily Ever After custom made to make me happily ever after, or at least until the next day when I find more books to add to my TBR pile. However, after reading the book, I found the similarities between the fairy tale to be few, and the ones that did exist were rather childish. The book seemed more an adaptation of Maggie Stiefvater’s Wolves of Mercy Falls series. The parallels to red riding hood that were included were: the fact that the main character’s last name was hood, she lived with her grandmother, and there was a wolf and an axe hefting woodsman involved. But that was about it. I really struggled to get through this book. It is pretty short, about 250-300 pages, and these would normally take me a day, two at most to finish. I dragged this book out for about a week. I tried over and over to get into the story and finally just gritting my teeth and forced myself to finish it. The characterization was flawed and incomplete. Normally, I connect very well with books written in the first person… only natural, as one of the benefits of 1st person narration, as they make the reader feel like they are the main character in the story. Not the case in Low Red Moon. Avery, the main character, was so bland that I had to go back a few times just to remember her name. Her beliefs and decisions were elementarily spelled out for her, not allowing the reader to come to understand who she is through her actions. Very little depth is put into the characters of Avery’s parents, she just trudges on and on saying how much she misses them and how different her life is. The writing gets very repetitive and boring. Ben, Avery’s love interest, comes out of nowhere and has almost no physical description. He too spells out how he feels, rather than acting in any way that portrays emotion. The couple’s relationship fits the pattern of hot boy meets average girl, and they inexplicably fall in love out of the blue…There is NO originality in this part of the plotline. The romance and subsequent bonding are tedious and unexplained. I felt almost no connection to any of the characters in the book. To be perfectly honest, I was kind of shocked that the author of this book has a successful YA series under a different name. The writing has a tone and style that is dumbed-down, a HUGE pet peeve of mine. Just because the writing deals with particular topics relative to teens and young adults, or has a protagonist who is young, DOES NOT mean that the readers can’t handle complex plots, subplots, and depth in their characters. Think of the most successful YA and teen books of our time. Harry Potter, The Chronicles of Narnia, etc. These books are just as complex as many adult books and the characters practically pop out of the pages they are so real. Perhaps what threw her was the addition of a paranormal element. Some authors seem to think that paranormal romances, whether for young readers or adults are “softer” than their contemporary counterparts. It’s like the addition of a vampire or fairy somehow makes the plotting less important because the readers have so much more to focus on. I give Low Red Moon 1 Key... Not too much to say. I was NOT a fan. Nothing worked for me. At ALL. My biggest complaint was how rushed everything was. There was 244 pages, but the print was huge, the margins were enormous, and there was art on the tops and bottoms of some pages that took away from the story. So...clearly I didn’t like this book, but some other book bloggers have had much better experiences with it so I will link their reviews here so that you might have a bigger pool from which to decide if you want to read Low Red Moon or not. In my opinion, if you want to check it out from the library or get it some other way for free, go for it...but it's not worth the money to actually buy it in any way, shape, or form. My thoughts exactly. I really wanted to like this one too, but I just couldn't. Also, I didn't even know it was supposed to be an adaptation of Red Riding Hood. However, I must say that Ivy Devlin has the creepy axe murderer part down packed. Maybe she should write murder mysteries. I wanted to read this for quite some time! Oh, dear. I've had this one on my wishlist but know need to check it our a bit more.